« Le Comptoir du village » (05 65 50 10 06), in the village center, sells bread, regional products and drinks. Opening times : monday from 8.30 to 12.00 am - from tuesday to saturday from 8.30 to 12.00 am and from 2.00 to 6.45 pm. Closed on sunday. Post office inside during opening hours. Pentadou adheres to "Campaign for the elimination of bed bugs" and regularly sprays the rooms with natural ecological products. Pilgrims can visit the church. Ask the Pentadou for the key. House-trained dogs are welcome ; there is a field for horses and donkeys. 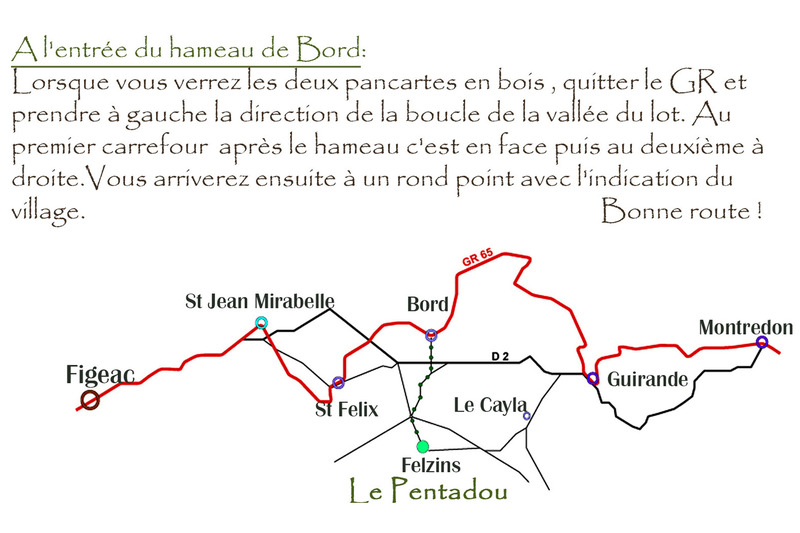 To find Felzins and Pentadou from the Compostelle way (GR 65), see the map. 10 beds in 2 dormitories. No bunk-beds, but some are situated on mezzanines. If you are more than ten, ask us. Beds with fitted sheet, pillow case ; but you must have a sleeping-bag or a bag-sheet. Blankets are at your disposal ; towels are not supplied. Breakfast with home-made jams is served at the table d'hote from 7.30 to 9.30 am. It includes home-made aperitif, hors d'oeuvre, main course with vegetables, cheese and dessert. Wine is included (a jug of wine). Menu vary according to the time of the year, the weather, what is growing in the vegetable plot and my own ideas ! As far as possible we buy all our products from local producers. Otherwise, you can prepare your own meals in the kitchen at your disposal. Walkers, pilgrims and hikers are welcomed as from 4pm.